Quail are popular birds to keep for their delicious eggs. They will usually come into lay at approximately 8-12 weeks of age. Really productive strains of Japanese or Coturnix quail as they are sometimes called can lay up to 300 eggs in a year, but for this level of egg production they do require the correct quail feed as well as some additional light over the dark winter months. Quail do not over-eat so can be fed ad-lib as with other poultry however if you feed them with a quail seed / pellet mix, make sure you use a hopper with ‘anti-spill fingers’ because they can waste a lot of it by flicking it out onto the floor as they search for their favourite seeds in the mix. It goes without saying that quail should have access to clean fresh water at all times. Great care needs to be taken with the chicks to ensure that they cannot fall into the water and many quail keepers recommend placing small pebbles or marbles in a shallow water container not only to attract them to the water source but to enable them to get out again should they fall in. Quail should be started on a crumb. A non-medicated turkey starter crumb is ideal since it is higher in protein than chick crumb. 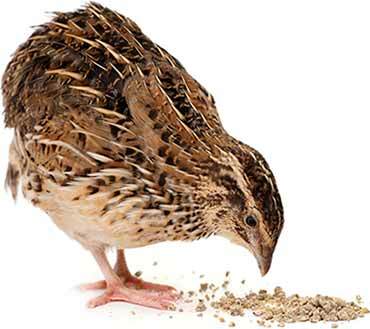 At about 5-6 weeks of age the quail can be gradually changed onto a grower/finisher ration, again a turkey feed should provide the correct protein levels. Quail being raised for the table can remain on the grower/finisher ration until they reach their killing weight if that is their destiny but quail being kept for their eggs and breeding will require a breeders ration of 18-20% protein, which should be gradually introduced before the birds are expected to come into lay around 10 weeks of age. As a guide adult quail will require approximately 15g of food per day and it is recommended that quail of all ages should have access to ad lib food. As with other poultry, greens are very important in the diet of a quail. This can be as simple as some fresh grass, although they will appreciate a wide variety of leafy green vegetables from the garden or allotment.